I told you not to tell anyone! Let me explain. Do you know the first thing I do when I get a new DVD? I go onto the internet and check to see if it has any easter eggs. Yup, easter eggs. If you’ve never heard of DVD easter eggs before then let you probably think I’ve gone mad but I haven’t. Easter eggs is a phrase that’s used for an inside joke or hidden message within a DVD or book or paintings or crossword or computer games. So, for example, a cheat code for a computer game is an example of an easter egg. It’s there but you don’t know it’s there until you find the code and unlock the cheat. Well, the Compton Valance books have easter eggs too. The question is, can you find them? I tell you what, I’ll give you a clue. The secret hidden easter eggs are all numbers. When I wrote the first book I needed a load of random numbers to use on Samuel Nathaniel Daniels FPU Time Sheets. I could have just come up with some meaningless series of numbers but I thought it would be cool if the numbers meant something too. For example, above is page 21 from Compton Valance: The Most Powerful Boy In The Universe. 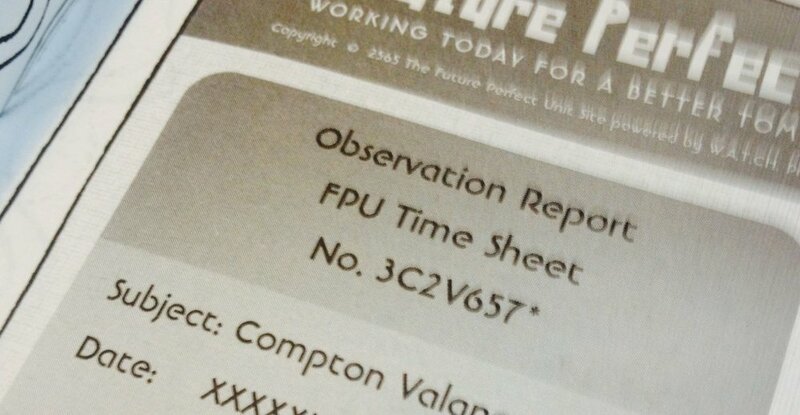 As you will see, this first FPU Time Sheet has the code 3CZV657. If you put 3CZV657 into your internet search engine you will find that 3CZV657 is connected with the DeLorean car that Marty McFly uses in Back To The Future. So the first easter egg is a piece of Back To The Future trivia. The time machine Delorean car’s registration plate in the movie is ‘OUTATIME’ but the car was a real car before going into the film and had an original registration number of… 3CZV657. Back To The Future is one of my favourite time travel films and so I thought I’d use something from it as my first easter egg. Okay, so now it’s time to go on an easter egg hunt of your own. Check out the FPU Time Sheets in Compton Valance: The Most Powerful Boy In The Universe and put the numbers you find into an internet search engine. You never know what you’ll find. SPOILER ALERT… There are even more easter eggs in the new Compton Valance book, the Time Travelling Sandwich Bites Back. Look below and you’ll see the number 1296 and the name ‘Yahtzee’. Try putting them into a search engine and seeing what comes up! And remember that when you read one of my books, look out for numbers and names, they will often have more to say than you first thought!